Your home or commercial facility contains many of your most valuable possessions. SERVPRO of Macon understands the trauma that follows a loss. When fire damage takes control of your life, we help you take it back. Inventory – One of the first priorities in fire restoration is to complete an accurate inventory to help ensure you can properly account for all your belongings. Your SERVPRO of Macon technician can provide a detailed room-by-room inventory of contents, including digital photographs and bar codes for each item, suitable for filing insurance claims forms and relieving you of this often stressful and time consuming process. Move Outs – When the structure has suffered extensive damage, the cleanup and restoration process may need to be facilitated by relocating the contents for cleaning, deodorization and storage while structural repairs are being completed. A supervised moving crew can carefully pack and move the entire contents of your home or office and move them into our secure facilities. Contents Cleaning – All of the restorable contents in affected areas will be professionally cleaned and deodorized. This includes area rugs, furniture, draperies and upholstery. SERVPRO of Macon technicians begin by carefully inspecting and testing all fabrics in the structure to determine which cleaning methods are most appropriate. SERVPRO of Macon can provide wet or dry cleaning. Additionally, all the other restorable contents will be cleaned and deodorized to as near as pre loss condition as possible. This includes electronics, art, wood furniture, kitchen items, clothing, bedding, bric-a-brac and much more. The sooner you respond to a water emergency on your property, the less the damage will cost you. Go with the team that’s faster to any-sized disaster. 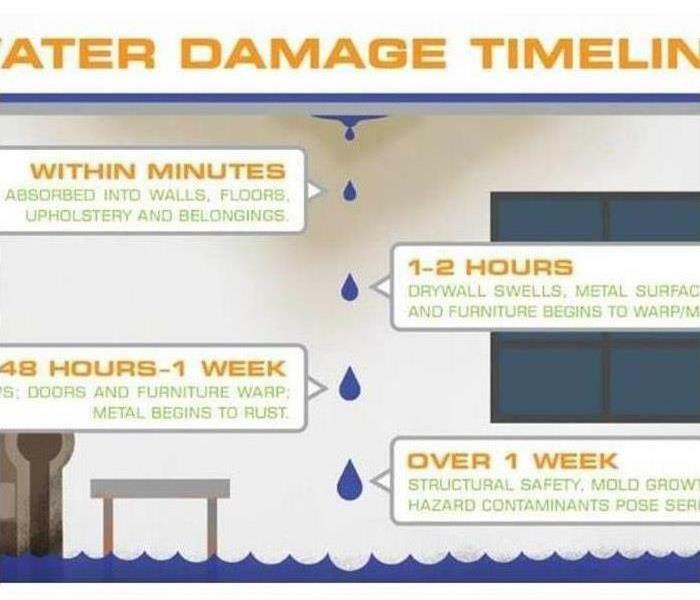 Within Minutes - Water is absorbed into walls, floors, upholstery and belongings. Within 1 to 2 Hours - Drywall swells, metal surfaces tarnish and furniture begins to warp/mold. Within 48 Hours to Week - Mold grows, doors and furniture warp, metal begins to rust. Over A Week - Structural safety, mold growth, and biohazard contaminants pose serious risks. ONE – Within one hour from the first notice of your loss, a SERVPRO Franchise Professional will contact you to arrange for service. Sometimes unexpected things happen to our homes. One of these can be a tree falling thru our roof in the middle of the night due to a storm. When this happens, our team is available 24/7 to respond. One of the major concerns is secondary damage such as rain. 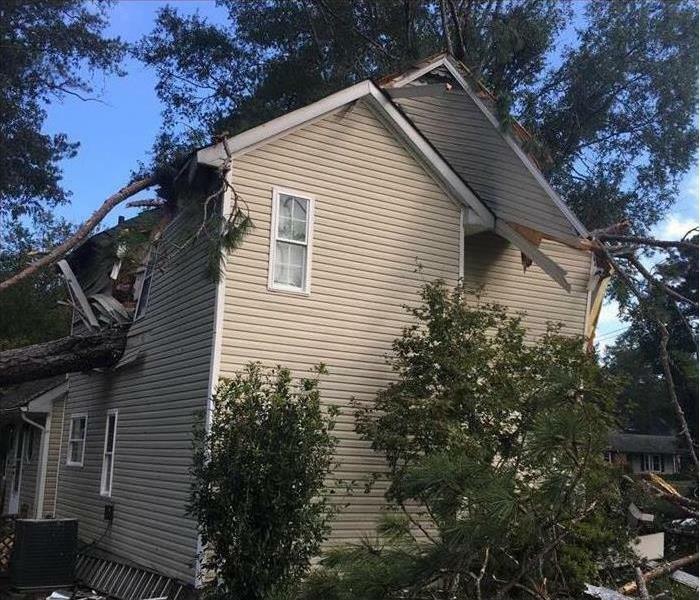 If a tree falls thru the roof and leaves a big opening you could be looking at a very expensive restoration project versus the initial damage. I is important to get a temporary cover on the roof or side of the house that is damaged. It is important to have adequate manpower to extract the water immediately but also make sure that additional water does not come in. Once the water is extracted, the drying process can begin. We have large commercial desiccant dehumidifiers designed for climate control in large facilities. If you have any questions about Large Loss capabilities, contact SERVPRO of Macon at 478-474-6700 24 hours a day. 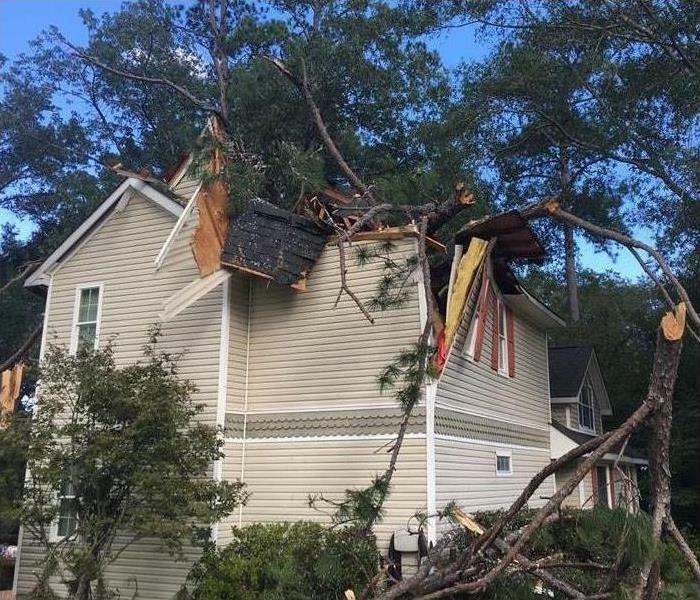 In September 2017 high winds of up to 60 mph came thru Macon and caused extensive damage all over town. Our team at SERVPRO of Macon was ready for the damage. We are prepared to respond to any type of disaster 24/7. We responded by having the manpower to provide temporary roof tarping immediately. We then addressed removing water inside the homes and starting the drying process. We also provided manpower to protect contents in homes where there was a need. It's important to have trained manpower whenever these types of events happen. Because not every loss is alike. SERVPRO of Macon has the capabilities to handle any size loss. If you have any questions about our Storm Loss capabilities, contact us anytime at 478-474-6700! Do you have an ERP for your business? Ask your SERVPRO of Macon Sales and Marketing Representative! In the event that your business has a water loss; here are some steps to help minimize damage and get you back in business. Mold requires moisture and a food source to grow such as wallpaper, drywall or other organic building materials. In most cases, mold grows from having high humidity in your home or business, a non-ventilated bathroom or a recent water loss. However, if you believe that you do have mold growing in your home or business it is best to have a qualified environmental lab take samples. An environmental lab will be able to explain the testing process and provide results based off of the samples taken from your home. Based off of those results, they provide recommendations on how the mold would need remediation. Then, SERVPRO can take those results and recommendations to properly remediate the home or business of any microbial growth. Want us to take a second look at possible mold? Give us a call at 478-474-6700! SERVPRO is a leader in the much overlooked market of document drying. In the event of a commercial water loss—it’s imperative that important documents such as legal documents, medical records and government documents are not overlooked. SERVPRO has the capability in the event of a disaster to restore these documents. Listed below are just a few techniques that are used to help commercial clients and their pertinent documents. • Vacuum Freeze Drying—Process in which an item containing moisture is frozen and dried using various vacuums and pressures to achieve sublimation. • Digitizing—Ability to digitize records and documents eliminating the need to have massive file rooms. • Gamma Irradiation—is a process that is used for cleaning/disinfecting decontaminated documents. In sewage or flood water (CAT 3) situations, documents are not only deteriorating, but they are infested with all types of bacteria. If you have any questions about SERVPRO’s document drying services, contact us today at (478) 474-6700! Did you know that each year more than 12,600 people are injured in home fires in the United States? It is important to be prepared and know the facts about home fires. Home fires can be prevented. Fire is fast. In two minutes, a fire could kill you. In only five minutes, a whole house can be engulfed in flames. Fire is very hot! However, heat and smoke have the potential to be more dangerous than the flames. Hot air can burn your lungs and fire produces poisonous gas that can make you sleepy and unable to escape. Fire is very dark. This can make it difficult to find your way out of your house during a fire. Fire is deadly! Fire uses up oxygen you need to breathe. You can always be prepared to prevent deadly fires in your home. Just taking a few precautions can help save you and your family. These fire facts were found on www.ready.gov!